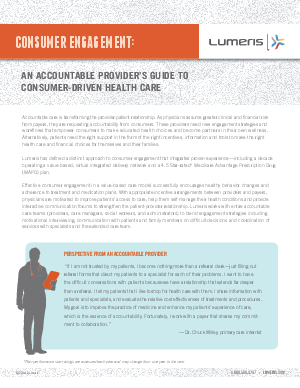 As physicians assume greater clinical and financial risk from payers, they are requesting accountability from consumers. These providers need new engagement strategies and workflows that empower consumers to make educated health choices and become partners in their own wellness. Alternatively, patients need the right support in the form of the right incentives, information and tools to make the right health care and financial choices for themselves and their families. Lumeris has defined a distinct approach to consumer engagement that integrates more than a decade of proven experience. With appropriate incentive arrangements between providers and payers, physicians are motivated to improve patients’ access to care, help them self-manage their health conditions and provide interactive communication forums to strengthen the patient-provider relationship. Lumeris works with entire accountable care teams (providers, care managers, social workers, and administrators) to blend engagement strategies including motivational interviewing, communication with patients and family members on difficult decisions and coordination of services with specialists and the extended care team.